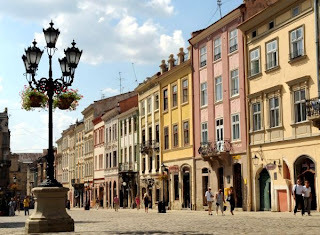 Lviv (Polish: Lwów, German: Lemberg) is a city in western Ukraine. Population: 760,000 (2010). The city is one of the most important centers of Ukrainian cultural, economic and political life and is noted for its beautiful and diverse architecture. 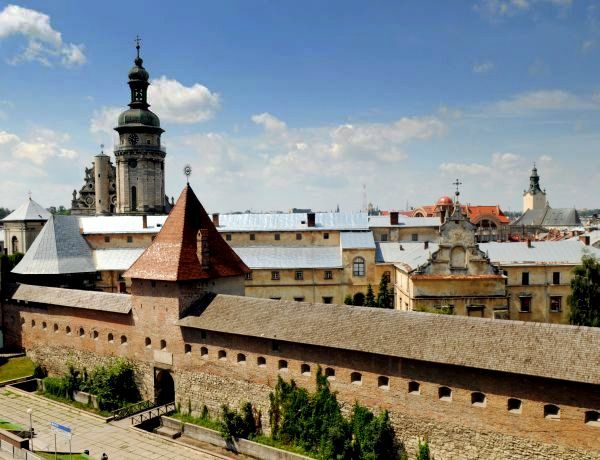 The historical city center has survived WWII and the following Soviet era and is included on the UNESCO World Heritage List. Lviv was part by the Austrian Empire from 1772 until 1918; under the name Lemberg it functioned as the capital of the Kingdom of Galicia. Compared to the Russian and German Empires the Austrians granted their inhabitants relatively much freedom, resulting in the town developing into a main cultural center for the Poles and the Ukrainians. Lemberg was also a major center of Jewish culture, in particular as a center of the Yiddish language. After the collapse of Austria-Hungaria Lwow became a part of Poland. In 1939 the Russians occupied the city, and between July 1941 and July 1944 Lemberg was under German occupation. In 1941 there were over 200,000 Jewish people living in the city (refugees included), from whom only 300 survived. After WWII Lviv was allocated to the USSR. Most of the Poles living in Lviv were resettled into Polish territories annexed from Germany, especially in Wroclaw (former Breslau). Since the collapse of the USSR in 1991 the city is a part of the Ukraine. Welcome to Ukraine. It's one of the most unusual countries in Europe. It's a fascinating country with a fascinating history. One day I hope to make a journey by car, through the Ukraine, to the Russian city of Volgograd (Stalingrad). There’s always something new to learn on your blog! That panorma is quite spectacular, with those green roofs really standing out. I just throughly enjoy the places you take us to! Lovely buildings too! I love your street maps! I am spending hours over them! I like this city we were there last year with my husband, and I should say it was an amazing journey, if you need help to create your own route you can contact with the http://touristclub.kiev.ua/ sure they help to make your tip more interesting. Good luck.